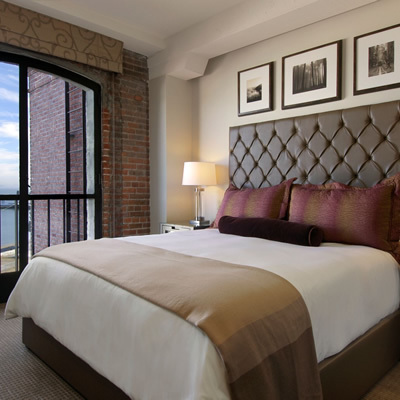 Located in the converted Ghirardelli Chocolate Factory, The Fairmont Heritage Place can be found in Ghirardelli Square in the beautiful Bay Area of San Francisco. The hotel offers apartment style accommodation for those seeking luxury, and being located in the Bay it’s just a few minutes from many of the city’s attractions. We experienced a two bedroom bay view terrace which was a contemporary New York loft style apartment with large windows and high ceilings. The lounge area had exposed brick giving the room a rustic and modern feel, there was a large fireplace, and ample lounge style seating. We loved the sound of the entertainment system which has the ability to play throughout the entire apartment, allowing you to enjoy your music whichever room you’re in. The apartments are designed to be a home from home experience, so the kitchen is large and fully fitted with every appliance and utensil that you will need. 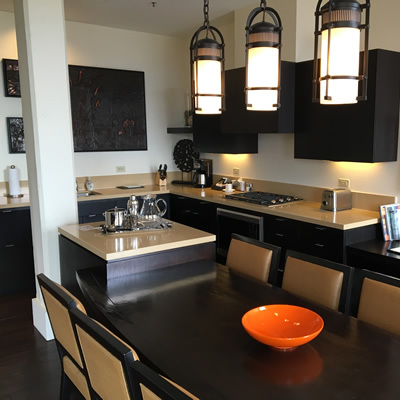 The apartment features a large open-plan kitchen counter with breakfast style stools making it easy to cook and dine. There are large window panels allowing you to make the most of the impressive views over the Bay from the lounge and kitchen, and a private terrace by the front door as well as the communal Mustard terrace which comes complete with outdoors sofas and a huge fire pit. The bedrooms are ample size and the two ensuite bathrooms were large and come complete with a gigantic bathtub, twin basins, and a wet room style shower. 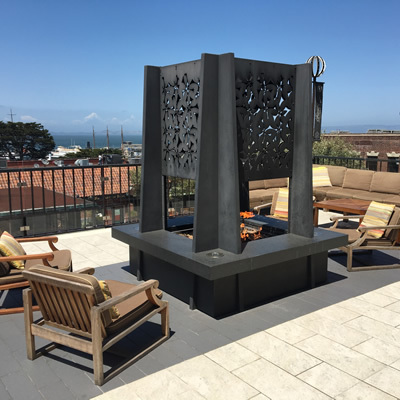 The hotel has a fitness room and also have bikes to lend for those who feel adventurous and want to explore San Francisco and for those less adventurous you have access to their resident chauffeur who will drive you anywhere in their luxurious Escalade within a 2 mile radius. There is also a lounge offering complimentary wine and cheese each evening, along with continental breakfasts. For those who fall in love with the property, or the city, they do offer a fractional ownership plan which allow you to use the property for around 35 days per year. This package also comes with other Fairmont properties around the world. The property is fully managed for you, so everything is taken care of allowing you to have a hassle-free second home. You can even arrange to have your food shopping taken care of so everything is in place for your arrival. The hotel also offers valet parking which is always most welcome when visiting a city hotel. 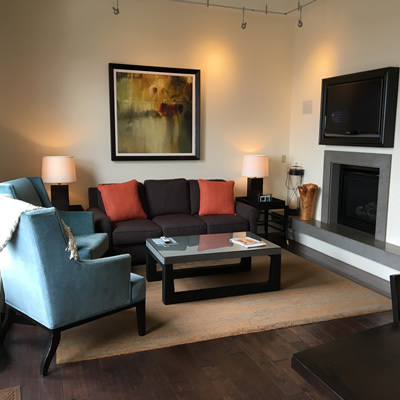 With its great location, stunning views, every need taken care of, and luxury apartments, our stay at The Fairmont Heritage Place was a joy, we will never tire of San Francisco and would return in a heartbeat.